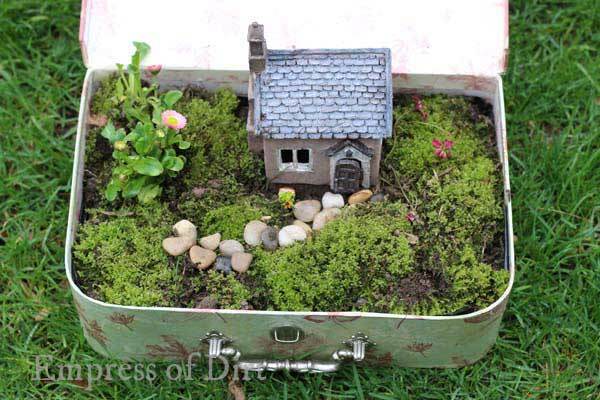 One of the best things about fairy gardens is how adaptable they are. You can create them in your home, in your garden, or on your patio, and switch them around at any time. Plus, the decorations can be changed to suit the seasons and special occasions. 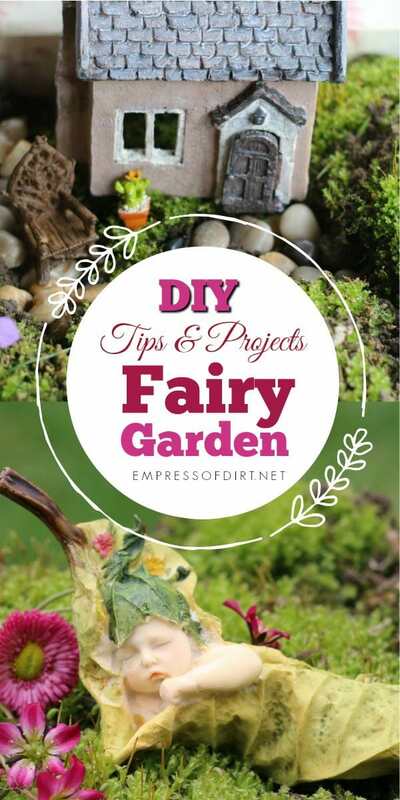 I’ve gathered some tips and ideas for you to use in your mini garden. If you want to use live plants in your little garden, this post on choosing miniature plants is very helpful. 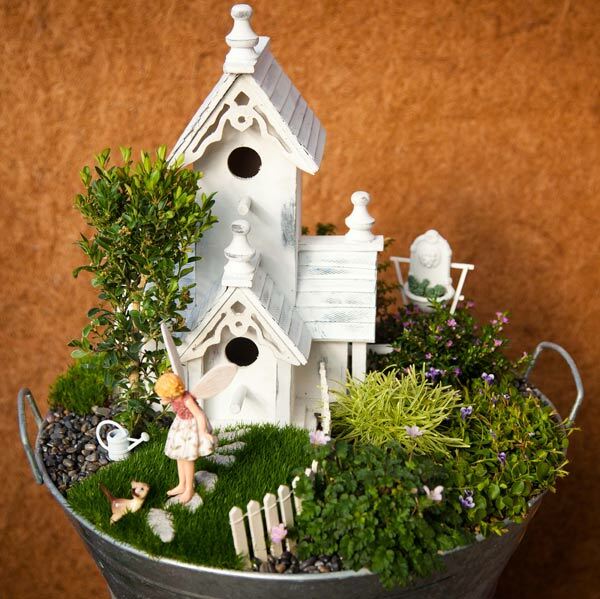 The number one tip for a great looking fairy or miniature garden is scale. By scale we mean, all of the items in your garden should be properly proportioned to each other. Just think of furnishings in your home and how big a side table is next to a sofa, or a chair is to a table. That’s scale. It’s functional and makes sense to the human eye. Choose your fairy garden furnishings to scale. Start with a favourite item and get the rest in the same proportions. There is more about scale in this post. Be silly. Have fun. Push boundaries. Have a sense of humour. 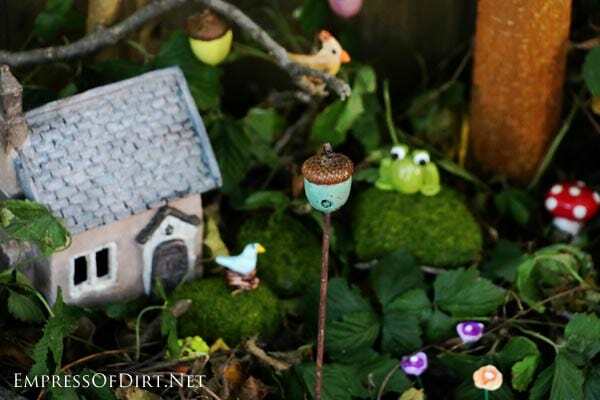 While scale or proportions will inherently give the fairy garden a sense of cohesiveness, there’s no reason why you can’t make it as creative, corny, silly, or ghoulish as you like. Pick a theme and see where it takes you. Think outside the flower pot. One of the best things about little gardens is…they’re little! I like to create them in portable containers so I can move them around as needed. Sometimes they need to be protected from the weather, other times I want to display them where they can be enjoyed, by a patio or indoors. The little suitcase you see here is one of my favourites. 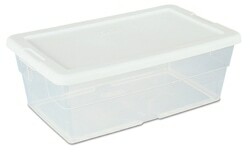 This one started with a plastic shoebox. I have one fairy or gnome garden in a spot where the neighbourhood children can see it. I love hearing what they say as they peer through the fence and notice what’s new. I recently added a little fountain to the garden so it looks like a watering can is constantly spilling over the garden bench. It’s ‘real’ touches like this that really bring it to life. This short video shows the water running. It’s really sweet. If you want to make the toadstools, the tutorial is here. 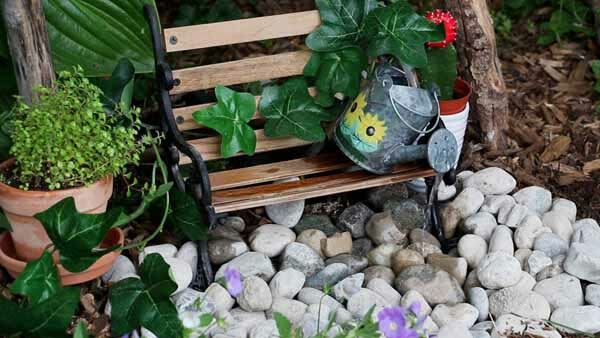 If you are resting on a couch after fainting when you saw the price of some fairy and miniature garden accessories, take a sip of a cool drink and sit up because there is hope. You can make a lot of things yourself. And yes, I mean you. You don’t have to be some sort of crafting wizard to create a lot of neat things. Little scraps of wood can be made into funny signs, picket fences, walkway steps, or furniture like rustic tables, chairs, and benches. I use polymer clay to make all sorts of things like fruits, vegetables, animals, birds, signs, cups, plates, bowls, cupcakes, donuts, plants, water lilies, and more. This is a helpful introduction to polymer clay and this post shows how to make some basic items. Seriously, it’s easy and will save you a ton of money, or at least a fairy ton. And you might just love it so much you make some to sell. 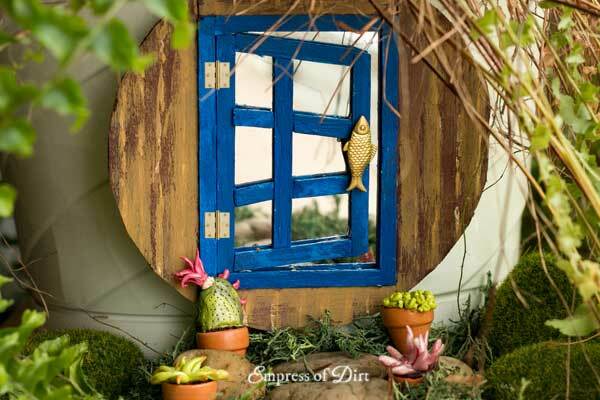 This mini fairy garden door is a replica of a full-size optical illusion mirror I made for my garden. They add a wonderful touch of mystery as you cannot tell if there is really a little world beyond the door. 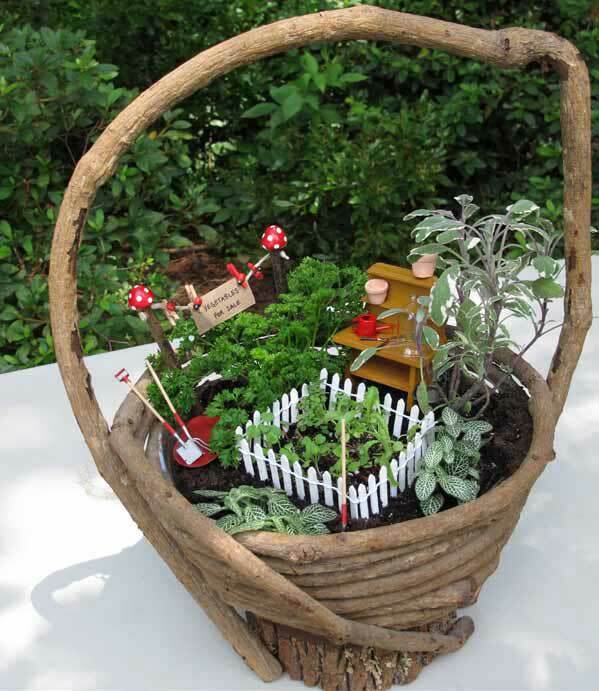 I loved all the ideas, and samples of making and even plants for the fairy gardens! Thanks to you my granddaughter and I will have a blast!